Fresh off an 18-hour nap, which started with breakfast at Shake Shack (I am going through withdrawal with the Madison Square Park location under renovation) in Terminal 4 at JFK, I landed in Dhaka, Bangladesh via a short layover in Dubai. For this trip, I had the pleasure of speaking at the recent Innovation Xtreme conference. 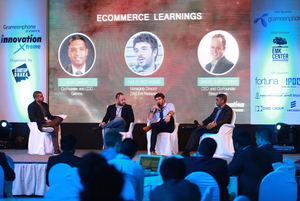 The daylong conference was organized by Startup Dhaka and sponsored by GrameenPhone and the EMK Center.